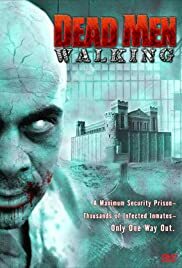 A Maximum Security Prison - Thousands of Infected Inmates - Only One Way Out! Sweeny: Somebody want to tell me why I had to do that? I do NOT enjoy shooting staff members! For me the movie went down the drain pretty fast after and due to the lack of scriptwriting talents few obviously infected convicts were forced to the canteen, so the hell surely broke loose. Nevertheless the idea of zombie epidemic in a high-security prison was still interesting to follow. Apart from the script, the camera, most of the acting and especially sound work were killing the concept frame by frame. Ten repetitions of guts being pulled out of the bodies... Constant green toning of the picture, why?.. Gunshots poorly synchronized with video.. I don't know what was making me follow - I guess it was the concept itself again. But somewhere in middle of this bad taste pride parade I was brought back to life by one totally brilliant scene. It was a shotgun slaughter with classic piano concert in the back (something from Tchaikovsky's "Seasons", I guess). It was so perfect match of time, picture and sound, although this trick is not a novelty (check e.g. The Silence of the Lambs). So while making your mind please take into account that I added one extra star for Thaikovsky.